Pens at the ready, erasers for the steady, and paper for the go. 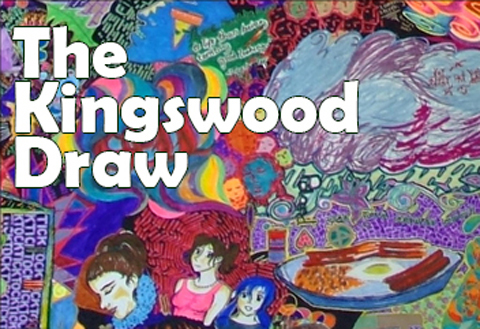 The Kingswood Draw on the 17th April is a free even for all ages, where everyone is encouraged to draw, play, eat, and connect with one another for a fun filled creative afternoon. Six beautiful spaces will open up to the public, along with four amazing art laboratories, which will be running workshops at Kingswood House between 2pm-8pm. Start your journey on the big spinner, then follow the trail though the house, and experiment in different styles of art. Join Ivan Liotchev in the Drawing Lab, where you can take part in a freestyle International Collaborative Drawing Project, then go to the Play Lab and get active in a digitised physical experience. Move your feet and dance away to create patterns on every surface of the room. No one will be able to say they are a starving artist after a trip to the Eat Lab, where you will be creating your own edible art. Finally, socialise in the Connect Lab while making a collaborative sculpture using coloured thread linked by public participation. Share your ideas of home and identity and see the structure evolve throughout the day.